One of the questions I get most often has to do with the cover of Dangerous Curves atop Hollywood Heels. Who’s that girl? I selected this photograph of actress Gladys Walton for the cover of Dangerous Curves. My publisher agreed. It was the perfect image to represent a group of actresses whose lives and careers took a variety of twists and turns–I called them dangerous curves–in their journeys through Hollywood. It is also my favorite Gladys Walton photograph. 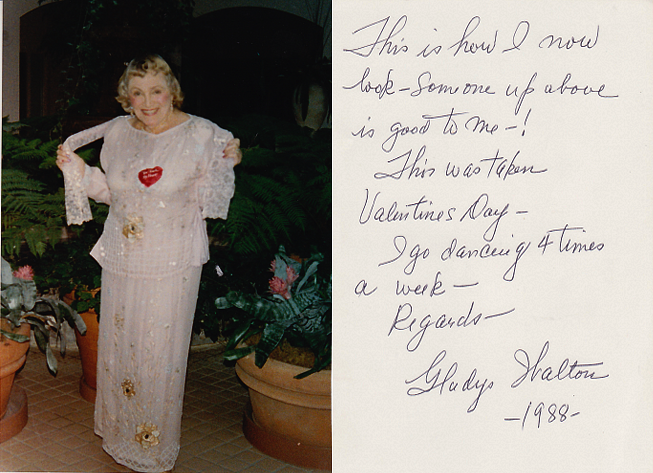 Gladys gave me the photo when I spent an afternoon with her in Morro Bay in the early 1990s. My interview with her is featured in my first book, Broken Silence: Conversations with 23 Silent Film Stars. She called her home Glad’s Castle. “You can’t miss it,” she told me before I left Los Angeles for Morro Bay. It was one of the oldest waterfront homes in the seaside village. Inside her domain, there was no doubt that Gladys reigned in Glad’s Castle. 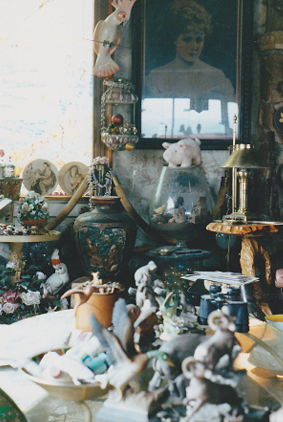 There were wall-to-wall antiques from her travels around the world, sea shells, memorabilia, and exotic birds, one of which called her name over and over. 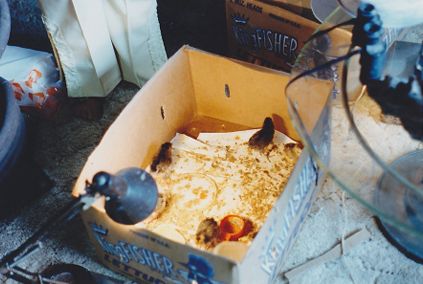 She was even raising a brood of baby chicks in one corner of the living room. Let’s have a look. A vast collection of treasures suggested that the woman of the house had lived a rich and full life. With so much to talk about, it took a while to get around to talking about her stint in the movies, which only lasted from 1919 to 1925 and consisted of almost 40 films. 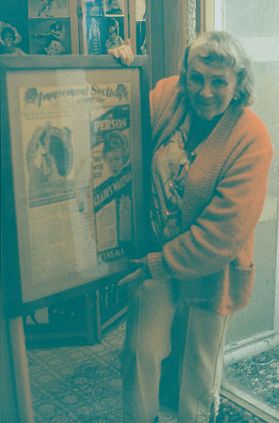 Gladys with framed ads from her films. Gladys and her mother were visiting relatives in Los Angeles in the summer of 1919. 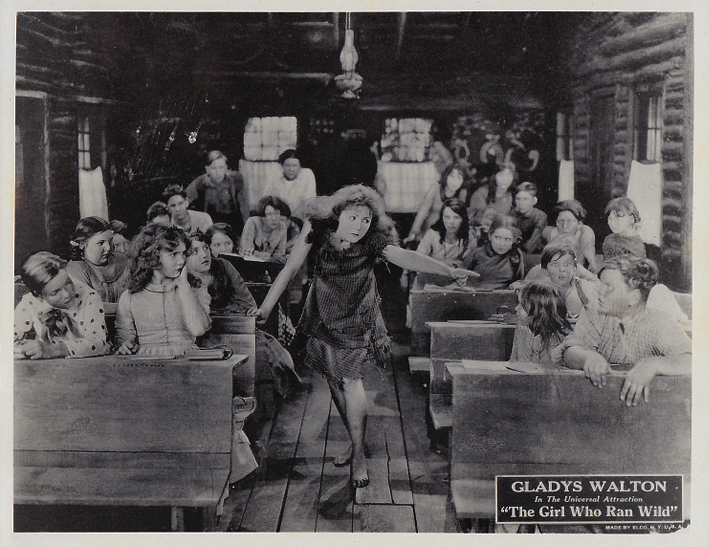 During their stay, Gladys’ uncle asked the 16-year-old if she would like to tour a movie studio. They visited the William S. Hart studio. Then a talent agent asked Gladys, who had no particular interest in the movies, if she would like to make some films while she was in town. Gladys’ mother gave her approval. 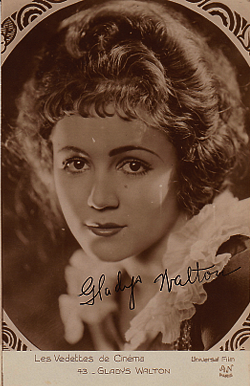 A classic Gladys Walton pose. She was taken to Fox Studios, where she was given a screen test. From there, she appeared in a couple of Sunshine Comedies with Slim Summerville. When not working, she would slip over to Theda Bara’s set and watch the vamp at work. During one of her visits to the Bara set, Gladys met cinematographer and director Harry B. Harris. He’d had his eye on her during the summer. Would she be interested in going to Universal Studios, where they were preparing to birth a new star. Although it was the end of summer, and the Waltons would soon be returning home to Oregon, Gladys’ mom agreed for her teenager to stay in Los Angeles and see how she progressed in the movies. As it turned out, a star was born. Gladys never returned to Oregon — or the classroom. 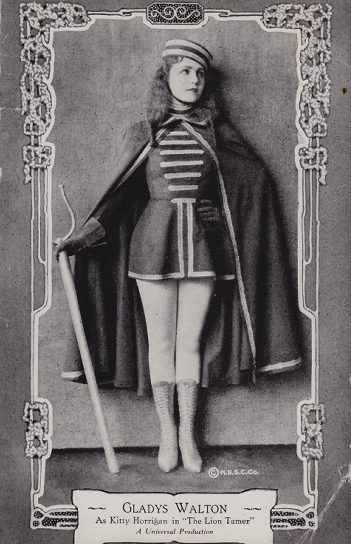 She made several films with the circus as their settings. In some movies, it seemed she was running from some situation in life and taking refuge to change its course. While she made friends with the likes of Lon Chaney and Priscilla Dean, she never fit into the Hollywood crowd. She was rather direct and usually spoke her mind. One day, a man wearing a straw hat and “potbelly” walked onto her set just as she was getting into a rather emotional scene. Her mood music wasn’t doing much for her. She asked the director to please ask the man to leave. He was distracting her. By 1923, she had grown tired of the monotonous work and the lack of creativity being given her films. She felt overworked and was bitter over being denied a vacation. When The Untameable wrapped, Gladys took her vacation. She sailed to Hawaii and enjoyed three glorious weeks in paradise. When she returned to Hollywood, the studio had docked her pay. Gladys turned on her heel and walked out of the studio and her contract. She sent word to a man she had been courting that she was ready to settle down. She married Henry Herbel, a district sales manager for the studio, in 1923. She made some independent films in the mid-1920s, but realized the role she most wanted to play was that of a mother. She retired for good without ever making a talkie. Gladys became a mother six times over the years. She led a happy and fulfilling life. 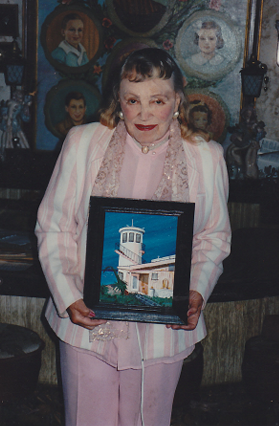 Gladys with one of her paintings, her rendition of Glad’s Castle. She studied portrait art at the Chicago Art Institute and sculpting at UCLA. When I spoke with her, she was out dancing four times a week and spending time with friends. It was all much more dazzling that her few years in films. Gladys Walton’s 1993 obituary from the New York Times.